Defending French Open champion Maria Sharapova moved into the third round Friday by finishing off a rain-interrupted 6-2, 6-4 victory over 19-year-old Eugenie Bouchard of Canada, while on the men's side 14th-seeded Canadian Milos Raonic lost to South Africa's Kevin Anderson in straight sets. 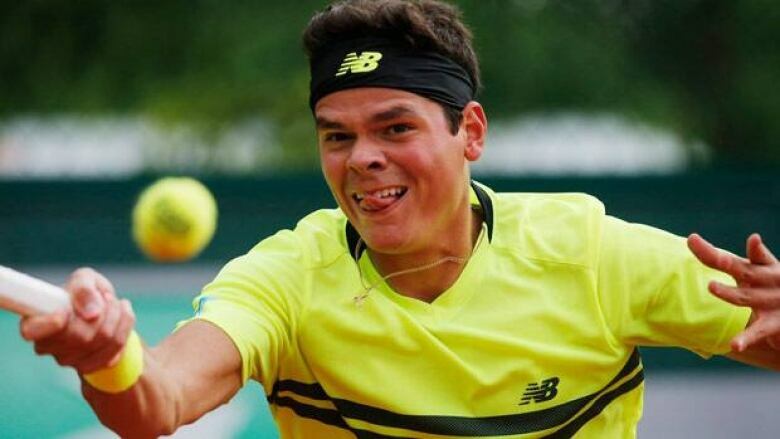 Canada's Milos Raonic dropped a 7-5, 7-6 (4), 6-3 decision to South Africa's Kevin Anderson in third-round men's singles play at the French Open on Friday. Raonic, the No. 14 seed from Thornhill, Ont., had his serve broken three times. "I wish I could have played better," Raonic said. "He was taking advantage of my second serve, I wish I could have done more on his. I don't think I served too great. "I lacked execution and struggled with being up a break in the third set. I didn't play well and a big part of that was down to him. He made me feel uncomfortable." Toronto's Daniel Nestor and new partner Robert Lindstedt of Sweden lost their second-round match to French duo Jonathan Dasnieres de Veigy and Florent Serra 7-6(3), 6-3. It was Nestor's worst result at Roland Garros since he was ousted in the second round in 2006. The third-seeded Nestor and Lindstedt lost in 75 minutes to snap Nestor's 19-match win streak in Paris. Nestor had claimed the French Open title the previous three years — with Nenad Zimonjic in 2010 and Max Mirnyi in 2011 and 2012 — and owns four trophies overall. He has also played in three other finals (1998, 2002 and '08). "Nothing went right for us." said Nestor. "The best comparison is to boxing match, where you get pounded early. "They came out swinging and we were on our heels the whole time." The loss was the first in Paris for the 40-year-old Canadian since he and Zimonjic were beaten in the 2009 semifinals by Lukas Dlouhy and Leander Paes. "They didn't do anything to surprise us, we weren't making shots," Nestor said. "In the first game they hit four winners to break and that set the tone. "They were hitting big shots and we were just hanging on. When we needed to make shots, we didn't." Nestor admitted it was tough to lose in Paris, saying "It was a good run." Nestor and Lindstedt broke twice but lost serve three times in the tight match. The hard-serving Canadian also lost in the third round at Roland Garros last year. "I would have hoped that I would be playing better on clay now," he said. "I'm frustrated with myself." Eugenie Bouchard of Montreal, was dispatched by defending champion Maria Sharapova 6-2, 6-4 in a second-round match that was completed Friday due to rain a day earlier. Bouchard trailed by a set and a break when the match was halted Thursday night by rain. The 19-year-old put up a stubborn defence Friday before falling on a first match point as her forehand sailed over the baseline. "It was a good experience, to play one of the best in the world," Bouchard said. "I saw her game, her shots. "She kept me on my heels a lot. I tried to counter that and was able to play my best game at some stages." The 2012 Wimbledon junior champion Bouchard wasted a chance to get to 5-all when she flubbed a backhand long, then covered her face with her hand. Sharapova took the next two points. She completed a career Grand Slam by winning the French Open last year, adding to titles at Wimbledon in 2004, the U.S. pen in 2006 and Australian Open in 2008. "It was such a long day yesterday, and obviously it's always difficult to have to come back," Sharapova said. Bouchard, who made her first WTA semifinal last weekend in Strasbourg, converted only one of six break chances and committed 22 unforced errors. Sharapova also won their only previous meeting in March in Miami. "I did better than Miami, it was more competitive this time," Bouchard said. "I wasn't quite as blown off the court as in Miami. "It was an improvement. I was excited and motivated and was really looking forward to the match." Miffed about the scheduling of matches at the French Open, Rafael Nadal took the court in the morning lacking his usual intensity, and it showed. The seven-time champion had to come from behind for the second match in a row to beat Martin Klizan 4-6, 6-3, 6-3, 6-3. Nadal criticized tournament organizers for scheduling his match with Klizan late on Thursday with rain predicted. The forecast proved correct, and the match was postponed a day, while Nadal's next opponent — Fabio Fagnini — won earlier Thursday and will have a day's rest before their match Saturday. "That's not fair," Nadal said. "Today I was playing almost three hours on court, and my [next] opponent was watching the TV in the locker room." Because the second-round match against Klizan was postponed a day, Nadal must win six matches in the final 10 days of the tournament to reclaim the trophy. While Nadal's behind schedule and unhappy about it, Roger Federer and Serena Williams easily moved into the fourth round. Entering the tournament, Nadal had lost only 14 sets in 53 matches at the French Open. Now he has dropped the opening set in each of the first two rounds. When Klizan's final shot sailed out, Nadal gave the cheering crowd a relieved thumbs-up and managed a weak smile. The Spaniard blamed his patchy play on a lack of practice time because of rain. "That makes the things not easy," Nadal said. "So I started the match probably with not the right intensity, with more doubts than usual. The positive thing was that I had a good reaction at the beginning of the second set. Even if I didn't play fantastic, I played the way that I had to play, with intensity, you know, with passion." Nadal also lost the first set of his opening match against Daniel Brands and was down 3-0 in the second-set tiebreaker before he rallied. Last year lost one set in the entire tournament en route to a record seventh Roland Garros title. Now 54-1 at the French Open, Nadal seeks to become first man to win eight titles at the same Grand Slam event. Federer, seeded No. 2, was broken in the opening game but held the rest of the way and eased into the fourth round by beating No. 30 Julien Benneteau of France, 6-3, 6-4, 7-5. Federer hit 31 winners with 21 unforced errors to eliminate Benneteau, who had won when they played at Rotterdam in February. "I'm able to play quite aggressive at the moment," Federer said. "I don't know if I can keep that up. But the important thing is to keep the errors somewhat low because otherwise it's just silly aggressiveness. It has to be controlled aggression." Federer seeks a record 18th Grand Slam title, and his first since Wimbledon last year. No. 12 Tommy Haas became the first 35-year-old since 2007 to reach the French Open's third round, beating 20-year-old American qualifier Jack Sock 7-6 (3), 6-2, 7-5. Haas next plays No. 19 John Isner, who overcame a two-set deficit for the first time to win an all-American match against Ryan Harrison, 5-7, 6-7 (7), 6-3, 6-1, 8-6. Isner is the last U.S. man in the field, because No. 18 Sam Querrey let a lead slip away in a 2-6, 6-3, 2-6, 7-6 (2), 6-2 loss to No. 15 Gilles Simon of France in the third round. Simon faces Federer next. An American player left the women's tournament when No. 29 Varvara Lepchenko was eliminated by No. 8 Angelique Kerber of Germany 6-4, 6-7 (3), 6-4. The No. 1-ranked Williams, seeking her first French Open title since 2002, beat Sorana Cirstea 6-0, 6-2 and has lost only six games in three matches. Williams swung hard, as always, but committed only 16 unforced errors and extended her career-best winning streak to 27 matches.